Episode 12: Where’s the tavern? 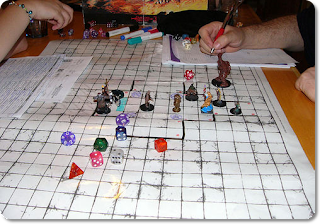 In this episode, Marty and I explore our various dives into Role Playing Games (RPGs), what we enjoy, and why have they seem to be gaining popularity again. I will be the first to admit that RPGs were not top on my list of games to play through the years and mainly because of the experience I had with my first adventure in AD&D. But times have changed and many RPG systems have made some great additions to a genre that would often scare the average gamer away. Plus, the Internet and technology have really made an RPG session into more of a tabletop game at times with miniatures terrain and other components to help those, such as myself, become more engaged in the adventure. *I screwed up when talking about Dragon Age when I was talking about what happens when you roll doubles and the stunt points you get. When you roll doubles, your Dragon Dice determines the number of stunt points you get. Sorry about that.